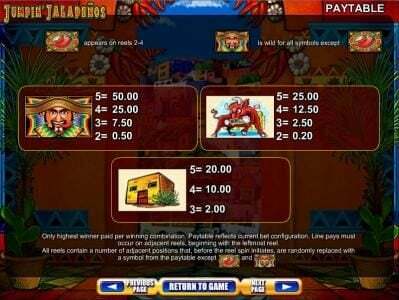 Jumpin' Jalapenos online slot machine pictures and slot feature list from WMS, play Jumpin' Jalapenos Slots for free. Jumpin' Jalapenos Slots 5 out of 5 based on 1 ratings. 1 user reviews. Jumpin Jalapenos, a wms slot that comes with 5 reels and 50 bet lines, offers a $2,500 top jackpot and a combination of free spins, scatter symbols and wild symbols as features. The Jalapeno is a spicy chilli pepper that is recognized around the world. It’s also something that is associated in this case with the Mexican culture and cuisine. The symbols used in this case are associated with this country and they combine various things that are recognized as Mexican, even though they’re available in other countries as well in some cases. Unfortunately the game uses a few too many playing card symbols, which are in the 9 to A range. 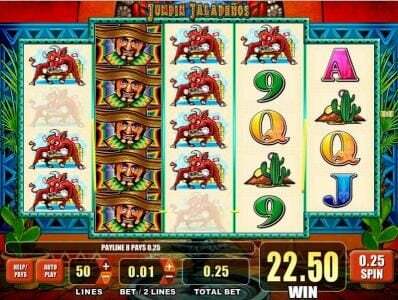 The rest of the symbols used by the game are the red peppers, the Mexican man, the bull and a building. As you can see, the majority of the game symbols are playing cards and they are not themed in any way to fit with the game’s topic. The game requires a single coin for every 2 lines, meaning that the 50 lines available will need 25 coins. The player chooses how many lines he wants to bet on and he also chooses the coin value. The coin denominations are between $0.01 and $5, with the maximum bet going up to $125. The top jackpot offered here is a 500 coin prize, with the cash value at $2,500. 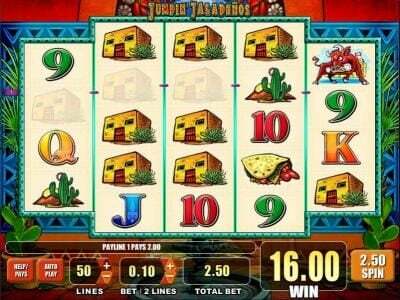 The Mexican man will do two things for the player that gives this slot a chance. It will first give the player the wild feature, meaning that it can substitute for other symbols if it’s in the right position to help the player get some additional combinations formed. It will also award the top jackpot, but for that to happen the player will need an entire payline to be covered with wilds. As a wild, it will not be able to substitute for the scatter symbol. Two of the reels of the game will have scatter symbols and will benefit from their presence. The player needs a minimum of three symbols in order to get the Free Spins started. A total of 12 spins are awarded in this case. If wilds show up during these spins, they expand and take over the entire reel. It’s a fairly typical Slot as far as the design is concerned and it doesn’t impress with any of its features, but it can be a decent way of spending a few hours. This new Slot Machine from WMS brings me right back into the land based casinos I played a while ago. I am amazed that we can play the exact same games we do at real casinos online now! Fantastic game play, sounds and fun with the multiple ways to win. 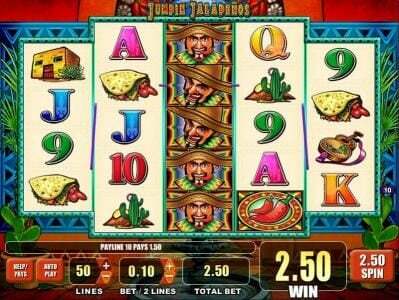 Jumpin' Jalapenos Slot Machine makes me feel right in the real Casino from my desktop! Great Job with these conversions from WMS Online Slots.